This route starts at a Home Depot in a popular shopping center district of Fort Collins, CO with plenty of free parking. 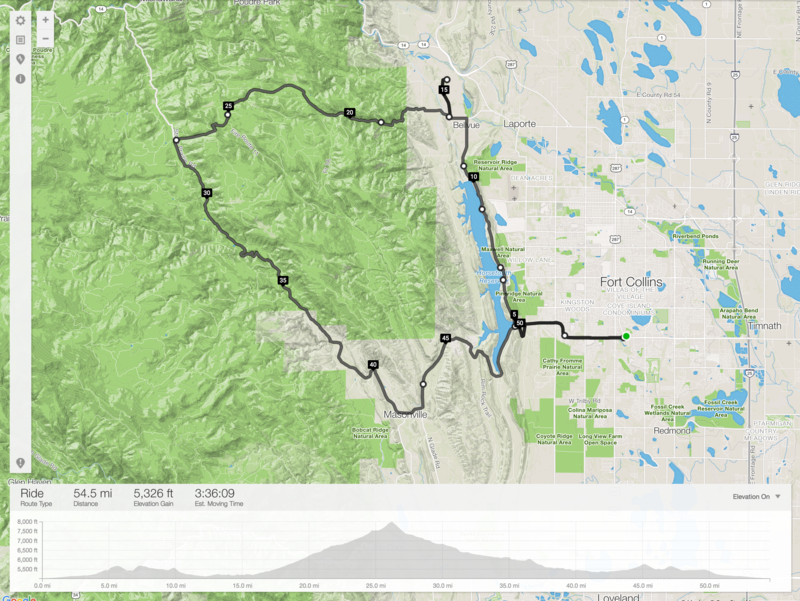 It begins with an easy warm up through the city in wide bike lanes before taking riders up the amazing roller coaster views of Horsetooth Reservoir. From these peaks, the water extends for miles on one side, and sights of all of Fort Collins on the other. The descents are fast so take care to be safe and avoid breaking the speed limit. It is not unheard of for cyclists to be pulled over by law enforcement. 15 miles in, riders will get their first of two rest stops in an open farmland area. The Howling Cow Cafe has refreshments, food, and restrooms (Note: this is the only stop with restrooms on the route). Stock up early as there is a large gap of heavy climbing and descending in the sun before the next and final refuel stop 27 miles later. This begins 11 continuous miles of climbing which will crest after almost 3000 feet. Gradients are similar to that experienced at Deer Creek in Highlands Ranch, CO. The steepest climbs come at the end of the ascent where the mountain goats will thrive in 14% and 16% max outs. As tough as the climbs are, the descents are complete bombing runs and make for quick acceleration through the canyon twists and turns. There is no escaping sun on the second half of the route. The last rest stop is Masonville Mercantile and comes up at mile 42. This is a tourist gift shop with a few fluids and Clif Bars, but no bathrooms. The ride finishes off with a light ramp up, back to the base of Horsetooth, before descending back to route start point.